Being older while trying to become pregnant, especially being older than the age of 40, can put a damper on your ability to conceive a child. Some statistics say that a woman’s fertility level drops after the age of 27 and goes downhill from there. There are advantages and disadvantages of getting pregnant at an advanced age and there are ways you can improve your chances. After the age of 45, however, getting pregnant is nothing short of a miracle. You have more experience. When you’re older, you have seen more of the world and are more settled in your career. Your stress level may be lower and you are more financially secure to go ahead and conceive a child. You are smarter. Older mothers tend to be more educated than younger mothers so you make better decisions in parenting. You are more likely to breastfeed if you are older, which makes for a healthier baby. You have the money to have a baby. An older woman has more financial security so that babies can have all of the things necessary to grow and live a healthy and well-balanced life. This is perhaps the biggest drawback of waiting to get pregnant until you are older. The supply of eggs in your ovaries goes down as you age and there is a greater chance of having a child with chromosome problems if you wait until you are older than the age of 35 to have a baby. The miscarriage risk is also higher as a woman ages. Women who are 40 and who are being treated for fertility problems have a 25 percent chance of becoming pregnant. By the age of 43, however, the chances of getting pregnant per cycle drops to ten percent, even with fertility treatments. By the age of 44, the chances of getting pregnant per cycle drops to 1.6 percent. There are more pregnancy complications if you wait to get pregnant. There is an increased risk of having hypertension and diabetes during the pregnancy and there is an increased risk of having problems with the placenta if you are older. Older women are more likely to have a baby that is premature or small for gestational age. 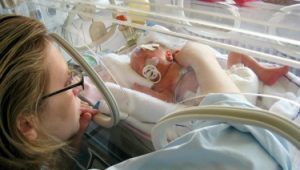 There is also a higher risk for stillbirth and babies born to older mothers have a higher risk of developing type 1 diabetes as they get older. Unless your partner is a younger man, the chances of having a partner with less than healthy sperm is higher if you are trying to get pregnant at an older age. Sperm that is unhealthy can lead to an increased chance of birth defects in the child, even though an older man will still make sperm until they are much past the age of 50. Having a baby usually means you can’t or won’t work for a while after the baby is born. This can cause you to lose your job or can impact your finances in such a way as to make child rearing a more difficult thing to undertake. If you work for a good company, however, you may have a good maternity plan and this won’t be as difficult for you. About 50 percent of women over the age of 40 will have problems with fertility, according to the CDC. For each cycle that you ovulate, you have about a 5 percent chance of conceiving a child in the natural way. Fertility-enhancement treatments can increase your odds of getting pregnant at an older age. Within a year of trying to get pregnant, however, you have almost a 50 percent chance of getting pregnant, which is much lower than the chances of getting pregnant in your mid-30s. 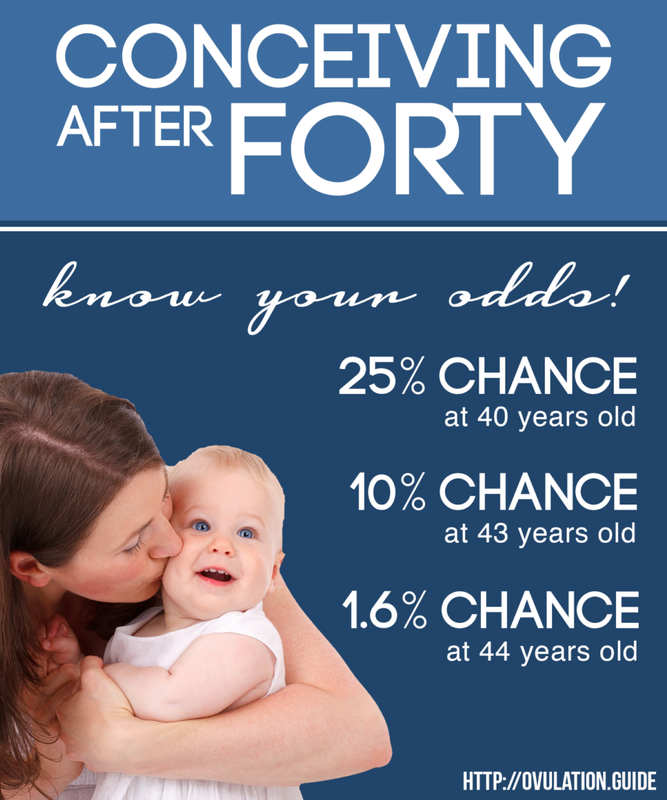 By the time you reach 43, your chances of getting pregnant drops to about 1-2 percent. The rate of miscarriage increases in your forties. By the age of 40, your chances of having a miscarriage should you become pregnant increases to 34 percent. By the time you are 45 years of age, the rate of miscarriage increases to 53 percent. Complications of pregnancy are higher as you get older and the rate of genetic disorders in the fetus is higher as you age. The cesarean section rate is higher in older women and the rate of still births increase as a woman ages. There are some things you can do to improve your chances of getting pregnant if you are an older woman (past the age of 40). If you don’t get pregnant within 6 months of trying to naturally get pregnant, you may want to be referred to a fertility specialist. A fertility specialist can try to find out why you are not getting pregnant and can use various techniques to increase your chances of getting pregnant. If there is no obvious reason why you are not getting pregnant, the problem is likely due to poor quality of eggs and decreased rate of ovulation. If egg quality is a problem, you and your partner can resort to in vitro fertilization using donor eggs or can try and use only those fertilized embryos that are found to be free of congenital/chromosomal defects. There have been a lot of advances in in vitro fertilization so, if you can afford it, it may be your only option to get pregnant past the age of 40 if you can’t get pregnant by yourself.